So What Do Simple Hashtag Community Visualisations Tell Us? The two hashtags are #alpsp and #jisclms, both things to do with academic libraries, publishing. I’ve plotted a couple of graphs (using Gephi) for each. 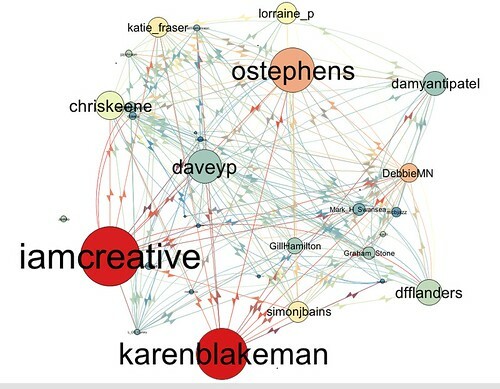 Firstly, the inner structure of the hashtag community, showing interconnectedness, node size proportional to the number of hshtaggers follower an individual, colour/hat proportional to the number of hashtaggers the person is following. In this case, large red means the individual follows and is followed by a large number of the other hashtaggers. Small red means the individual is following lots of the hashtaggers but not following many of them, small blue means the person has little connectedness with any of the hashtaggers, and large blue means lots of hashtaggers are following the individual but not many are following back. And secondly, the twitterati graph (via @scottbw;-) where node size is proportional to the total number of followers and heat the total number of friends. In this case large red means lots of friends and followers overall, large blue is lots of followers but few friends, small red is lots of friends and few followers. I’m less sure what this means in terms of actions that might be taken – are these people who would have been useful to have at the meeting? Or are they key contact points we can exploit? Any chance you could let your tools loose on the most prevalent hashtag, #eqnz? Or is there somewhere I could do this myself? Any help or pointers appreciated! I’m at a festival at the mo so hard pushed to do anything with the scripts myself; i’ll mail you a couple of gdf files that can be visualised in Gephi, but i wonlt be able to do anything myself with them till next week if that’s not too late? Well, I understand how I got onto the visualisations, but feel a fraud for being there! I would certainly have found the event useful and I followed the #jisclms tweets with interest but I’m sure my other Leeds Met colleagues attended will have gained and a great deal too – I’ll just have to drop bigger hints about Twitter to them at a future project meeting. 1. How does this group breakdown compare to the delegate group as a whole in terms of ‘type’? Librarian vs Publishing editorial vs Publishing marketing/PR vs Vendor vs Consultant etc. Is this the delegate breakdown in microcosm? 2. More librarians needed at ALPSP! 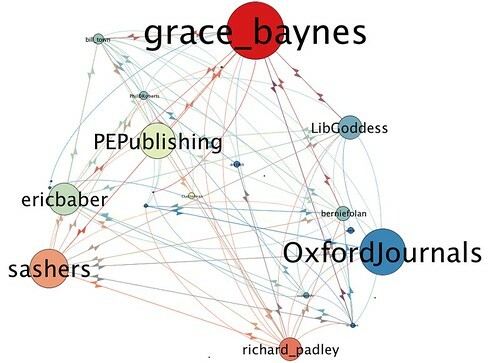 This is based on the insights and activity surrounding @libgoddess for instance. Not enough of her type I’d argue in this graph. 3. 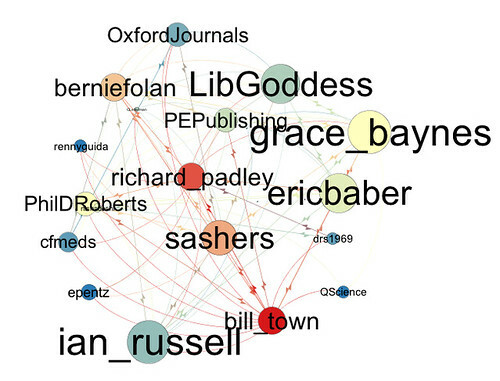 It’s not quite as pretty as a wordle but probably more useful as a visual representation of an event or the ALPSP mission, if the tweets of those featured were sampled by potential new members/delegates. That’s all I’ve got! Thanks for doing this, always good to consider what Twitter is ‘doing’. Just like on mailing lists, a few people do almost all the talking, and mostly to each other. The hashtag creates a self-selecting list. Unlike mailing lists, though, we don’t know how many folk follow a tag, though we can calculate the upper bound on how many people may have seen the tag from the followers of folk using the hashtag. What’s the distribution of folk you link to on OLDaily? JISC LMS programme projects all have unique hashtags. 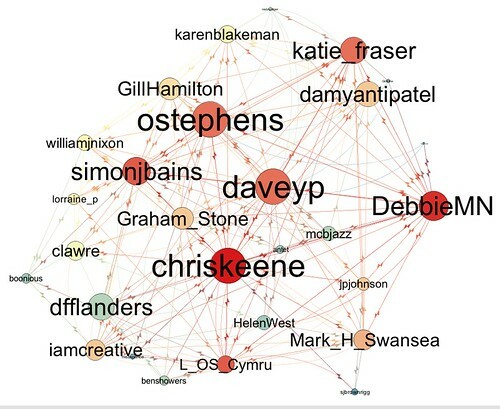 It might be interesting to see how the projects interact by looking at the relationships between tweets which also specify project tags as well as that of the overall programme. It would also be interesting to see if this changes, or grows, after a face to face programme meeting like the one held last week. I’d expect to see a relationship between #enclavelms and #aquabrowserux, for example, as overlapping projects at the same institution. Can this sort of visualisation be generated for hashtags as well as Twitter usernames? I’ve started mulling over what might be possible ito visuialising networks derived from folk using a couple of hashtags, but I really need to go on a couple of long dog walks to think it through… as to visualisng connections betweem hashtags, I guess one way might be to define a set of people, and then itemise hashtags those folk use as node size, with edges connecting nodes where >n people have used both tags? Next Next post: Structural Differences in Hashtag Communities: Highly Interconnected or Not?